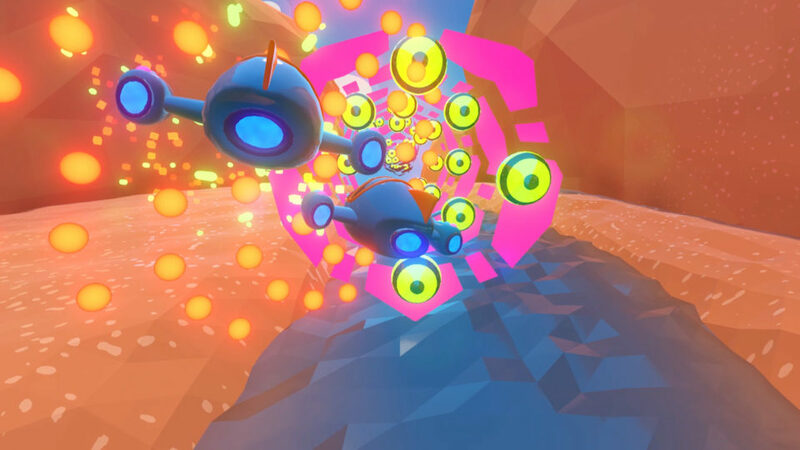 Towards a Perilous Journey is an odd duck of a shooter in VR. It’s a mixture of on-the-rails First-person shooting, utilizing a 3rd person viewpoint and bullet hell elements with an emphasis on enjoying the music that accompanies each stage. All of that may sound way more complicated then it actually is but it’s still best to know that TPJ is one of the more unique shooters I have ever played, in or out of VR. There is a lot of stuff flying your way. Each of your ships is mapped to a controller so you are going to need 2 tracked motion controllers to navigate the rather lengthy campaign. Each of your ships can individually shoot incoming targets which come at you from all sides with some firing a spray of slow-moving blasts your way as well. The key to navigating the 24-stage campaign is to destroy as many of these robots while avoiding getting hit. The more points you accrue without getting hit, the more powers you unlock which include increased firepower, shields and the ability to merge your ships onto 1, making you much less of a target, but reducing your firepower as well. As you advance through the game, new enemies are introduced as well as obstacles that need to be avoided. Points earned after completing a stage unlock a few more base power options, permanently increasing your offensive and defensive capabilities. There are 2 ways to tackle the campaign, by individual level or in one lengthy stage with latter adding a ton of challenge and I fully admit to failing miserably in this mode and stuck to the individual stages. TPJ look very simplistic with minimal details and textures which does lend itself to the smooth and near flawless presentation. No matter how much was happening on screen I never experienced any frame drops and stuttering so while it may not be the prettiest game you have every played, the visuals still do a great job of putting you in the game. As enemies take damage they pixelate until they explode which is a nice little effect that helped identify some of the more bullet spongey enemies that may be closer to death. The environments change up slightly throughout the campaign from greener areas near a river to wintery themed stages with mountains in the background, but no matter what that stage looks like, you still automatically proceed forward at a steady pace along a small play area that let’s you move your ships around a play space that accommodates the length and reach of your arms as you move around. On the audio side, there are intentionally no audio effects with an emphasis instead on the 24 musical tracks assigned to each stage. The lack of effects did make the game feel slightly awkward and while this is explained by the inability sound has travelling through space, the environments you play in don’t look that spacey and much more like you are traversing a vibrant planetside. 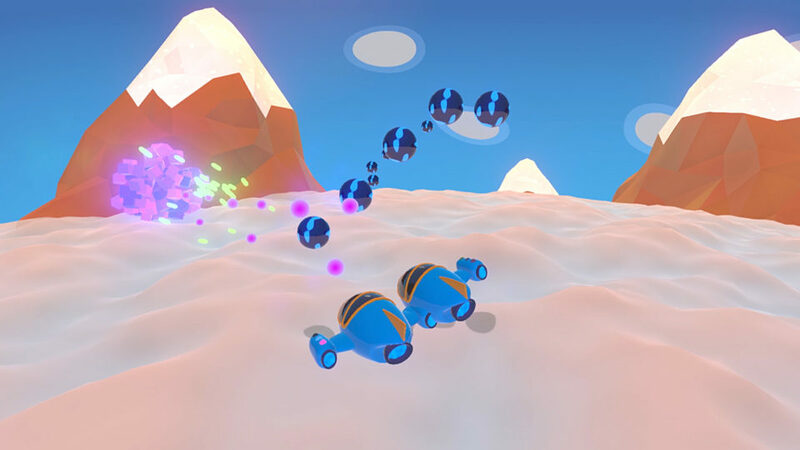 The music is described as having a predominantly electro musical atmosphere making the game feel slightly more Zen and tranquil then the action lets on. Once I got past the lack of effects though, I did enjoy the soundtrack as I attempted to crush the campaign. I have a few issues with TPJ and while none of them are game breaking, they do hamper the experience. The first and foremost complaint I have is the position and size of the ships relative to the headset. They are giant and to close to the headset making the bullet dodging portions overly difficult as your ships look to big to squeeze through the gaps in the incoming projectiles. That issue factors into my second which is that TPJ is just to difficult. I have only made it to stage 3 and have struggled to beat it as the difficulty just feels unforgiving. Each of your ships only has one life and can only take a set amount of damage and with no checkpoints in any stage. Death forces a restart and multiple deaths forces replaying the same stage, listening to the same song over and over until you succeed or give up…I gave up. After attempting stage 3 around 15 times, I had to quit for fear of losing my mind. The points required to upgrade your ship also seem high and I think TPJ could benefit largely from some type of easier mode to accommodate those with lesser skills. Otherwise, the mechanics here are solid, and I did enjoy the 1st person action disguised as a 3rd person shooter with the variety of enemies and the bullet hell madness making for an intense experience, I just wish I could get a little further. Tunnels offer there own unique challenges. Towards a Perilous Journey offers up a mashup of game types that I have never quite played before and what’s better is that those elements work great. It’s not perfect by any stretch and I did find the challenge offered by either play mode to be to much for my abilities. With that said, if you are looking for a unique VR shooter and love a good challenge then Towards a Perilous Journey may just be the game for you. What would I pay? Well, this one is a bit tricky as I seem to lack the skill, or patience, necessary to proceed very far in the game. As such, the $12 asking price would seem a bit high, but as I said the game is technically sound and the presentation does wonders at populating the screen with all manor of enemies and projectiles. If you are looking to put your skills and reflexes to the test, then the full price is by no means outlandish. 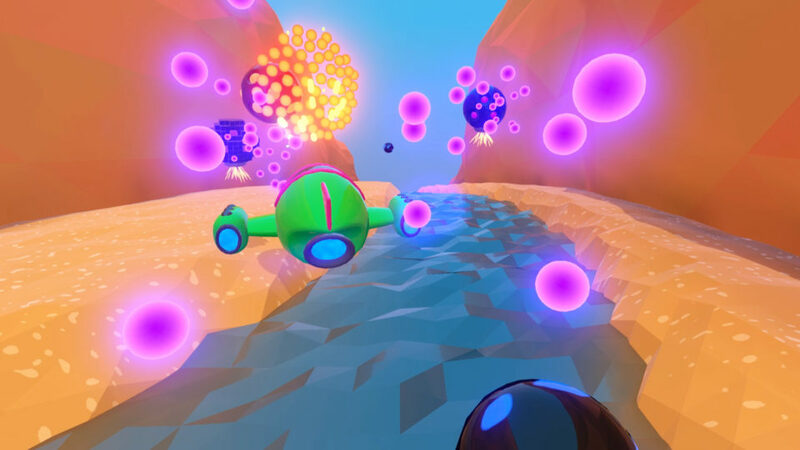 Sparkly Games provided The VR Grid with a press code for this title and, regardless of this review, we thank them for that! View of ships feel "off"